We are one of the most trusted organizations engaged in manufacturing a range of heavy duty camshafts for diesel engines that are used in ship engines, locomotives and power generators. Products offered by us are engineered with precision. We welcome queries for Camshafts for Diesel Locomotives from Overseas Countries like United Kingdom, United States, Australia, China, Denmark, France, Netherlands, New Zealand & Norway. Offering you a complete choice of products which include alco-251 - 6 inline engine with 140 deg cam angle, alco -251 - 6 inline engine with 123 deg cam angle, alco-251 - 12-v-type engine with 140 deg cam angle and alco -251 - 16-v-type engine with 123 deg cam angle. Manufacturer of a wide range of products which include dlw- 251d - 6 metre gauge camshaft (mg), dlw- 251b -12cyl fuel efficient camshaft (fe), dlw -16cyl conventional camshaft(con), dlw -16 cyl fuel efficient camshaft (fe) and dlw - 16cyl stiffer unit camshaft assembly (su). Manufacturer of a wide range of products which include gm-emd 16-710g3c-16 v type engine camshaft assembly, gm-emd 16-710g3c-16 v engine camshaft assembly and dlw emd-710 g3c-16 v type engine camshaft assembly. Our range of products include locomotive engine camshafts and engine components and engine camshaft. We are a part one approved source for the manufacture and supply of Camshafts for many of the DLW and DMW manufactured ALCO engines. We are a part one approved source for the manufacture and supply of EMD 710 G3C engine camshafts to Diesel loco Works Varanasi. 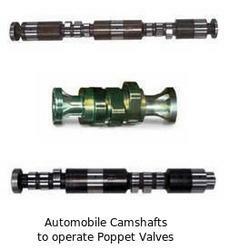 Offering you a complete choice of products which include conventional camshaft for industrial use.